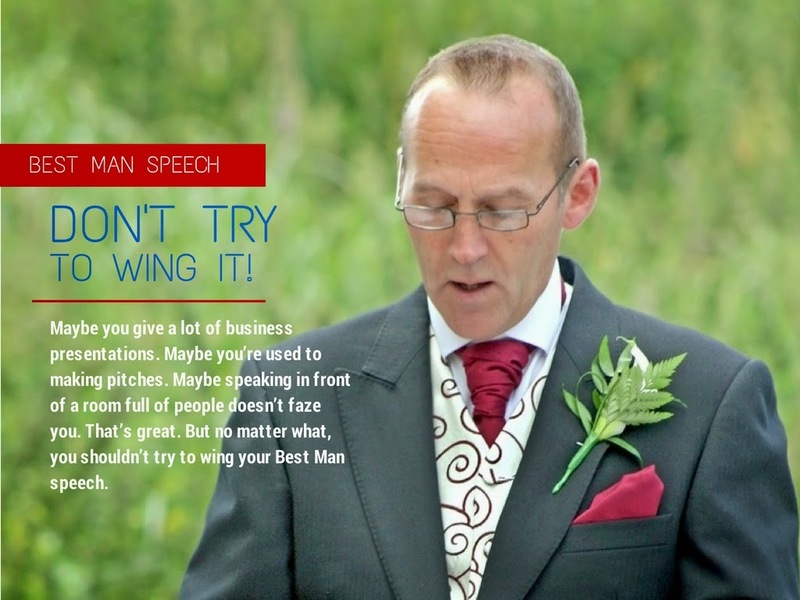 Five Tips for a Great Best Man Speech—No.1: Don’t Try To Wing It! Don't Try To Wing It! Maybe you give a lot of business presentations. Maybe you’re used to making pitches. Maybe speaking in front of a room full of people doesn’t faze you. That’s great. But no matter what, you shouldn’t try to wing your Best Man speech. This doesn’t mean that you have to write your speech out word for word, putting in every last comma and exclamation point. But you should map out clearly the main topics you want to talk about, the order you want to say them in, and the key points you need to include. If you do this, you won’t get stuck for words, you won’t forget to thank the people who need to be thanked, and you won’t get too carried away and go on for too long! To learn more about the craft of writing wedding speeches or a Best Man speech, visit us at www.weddingspeechesadelaide.com.au. Five Tips for a Great Best Man Speech—No.3: The Speech Isn’t About You! 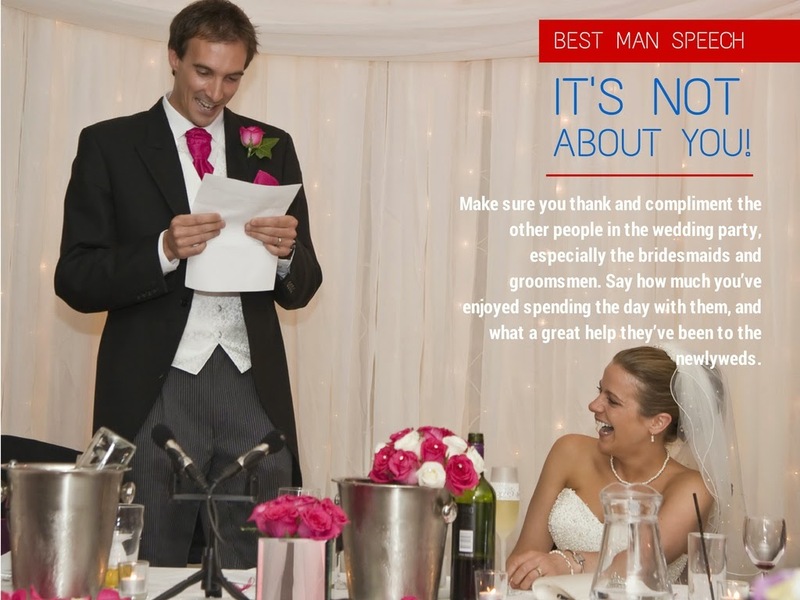 Best Man Speech Tip #3 The Speech Isn’t About You! It’s a great honour to be the Best Man but remember, the day is not about you! And neither should your speech be. Sure, you’re going to talk about wild and fun times that you and the groom have had together, but it should be about what he did, not you. Make sure you thank and compliment the other people in the wedding party, especially the bridesmaids and groomsmen. Say how much you’ve enjoyed spending the day with them, and what a great help they’ve been to the newlyweds. And most importantly, don’t forget the bride! Sometimes a Best Man speech only focuses on the groom and what a great guy he is, but a wedding is about two people, and the bride deserves a mention too! It’s always good to compliment her on her looks, but more importantly to talk about the positive effect she’s had on the groom, and how being with her has changed him for the better. Five Tips for a Great Best Man Speech—No.2: Avoid Novelty Speeches! We’ve all seen clips on You Tube of people giving brilliant ‘novelty’ speeches e.g., as a song, or a stand-up routine, or a TV show parody. One of the best examples I’ve ever seen was a guy giving his speech like he was the commentator on a horse race! 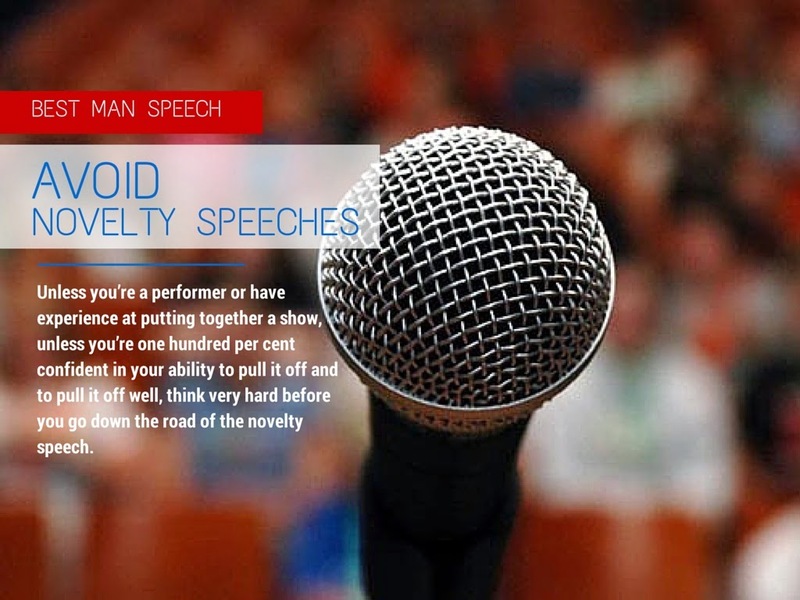 Unless you’re a performer or have experience at putting together a show, unless you’re one hundred per cent confident in your ability to pull it off and to pull it off well, think very hard before you go down the road of the novelty speech. If you don’t have the time to write and rehearse a ‘bit’ properly, walk away!